They've managed to overlook Trump’s talk about immigrants in favor of his assurances of safety and security. Donald Trump may not have been the first choice of many conservative Latinos who turned out for the Republican convention, but by this week plenty found a way to come around to him. That was the story I found as I wove through the aisles of the convention floor this week in Cleveland. Of course, it’s a self-selecting group. These are not the conservatives who felt scorned and disgusted by their party’s primary season, choosing instead to nurse their frustrations at home. These are the conservatives who schlepped themselves out to muggy Ohio for the week of speeches and revelry. These are the Latinos who have found a way to overlook Trump’s talk about immigrants in favor of his assurances of safety and security. One of them, Marco Rodriguez, a delegate from San Antonio, Texas, is a retired Marine Corps veteran who did seven tours of Iraq. We spoke Thursday night, while notorious anti-immigration hardliner Maricopa County Sheriff Joe Arpaio addressed the crowd. To Rodriguez, concerns about national security and potential terrorists sneaking in through the US-Mexico border superseded the discomfort of hearing Trump’s common depiction of immigrants as criminals, drug-dealers and murderers. “The way I look at it, Hillary and Obama will say nice things but give you policies that actually hurt,” Rodriguez, 49, said. “Trump has said a couple not-so-nice things, but I’m convinced, because I understand economics and national security, that we’re actually going to fare one hundred times better under him than under Hillary.” Rodriguez is Mexican-American, and his parents and one of his five siblings were all born in Mexico. Save for one sister he’s still hoping to convince, his entire family plans to vote for Trump in November. But in other circumstances, Rodriguez still prefers Ted Cruz, who was his original pick during the primaries. Even amid the pain of the primary season and uproar this week, he’d never consider backing anyone but his party’s nominee, he made clear. “Since before I became an adult, my whole family and I realized we couldn’t in good conscience be Democrats.” He identified more closely with the “traditional family values,” economic policy and strong military support of Republicans. Bertica Cabrera Morris, a delegate from Orlando, Florida, widened her eyes in surprise when I asked her to respond to the widely understood idea that Trump is not popular with Latinos. Other Latino conservatives have told a similar story. 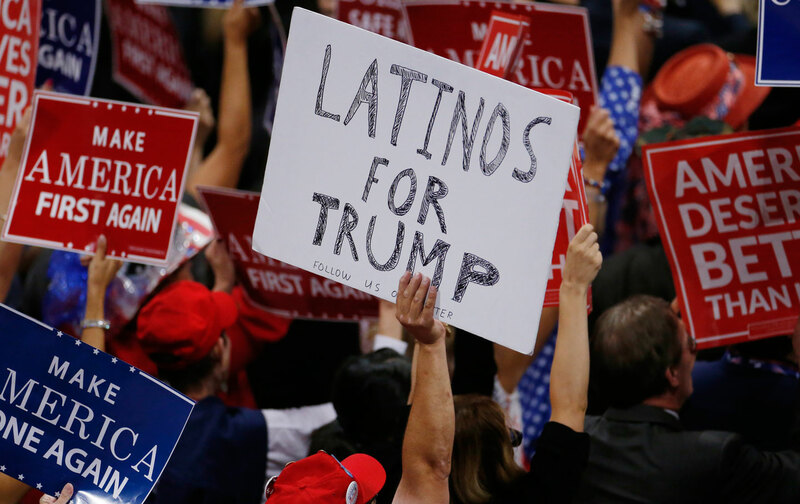 This week, 14 prominent conservative Latinos led by Alfonso Aguilar, president of the Latino Project for Conservative Principles, announced that they will be backing Trump in November. “We are not enamored with Donald Trump’s bombastic rhetoric and personality. But at least we know that Donald Trump won’t divide the country and fuel the flames of racial confrontation by accusing the police and the entire criminal justice system of being racist,” the announcement read. When I talked to Aguilar in January though, he had a very different line. “In the primary season, we’re going to continue to send the message to Republican voters that a vote for Trump or Ted Cruz is a vote for Hillary Clinton,” Aguilar told me then. It’s July now, though, and Aguilar has found his way into Trump’s corner. Aguilar was joined by Colorado Republican Jerry Natividad, the Latino Jewish Alliance’s Jacob Monty, and Vinicio Madrigal of the Louisiana Hispanic Political Action Coalition, among others. In the announcement, the signers said that, while Trump got most of the heat for his anti-immigrant remarks, Hillary Clinton could not be trusted on the issue of immigration either. The announcement pointed out, accurately, that two years ago Clinton called for the removal of unaccompanied minor children who were arriving in the United States from Central America. Other typically conservative Latinos have actually come out on the different side of the issue. On Wednesday, the US Hispanic Chamber of Commerce announced that it’s endorsing Hillary Clinton for president. USHCC President Javier Palomarez was in Cleveland all week, frequently appearing on cable news and even hosting an event with Ohio Governor John Kasich, whom the USHCC backed during the primaries and who declined to step foot inside the arena in his home state.